Elizabeth Skin Care uses only the best of products to achieve the best possible results for all of our clients. 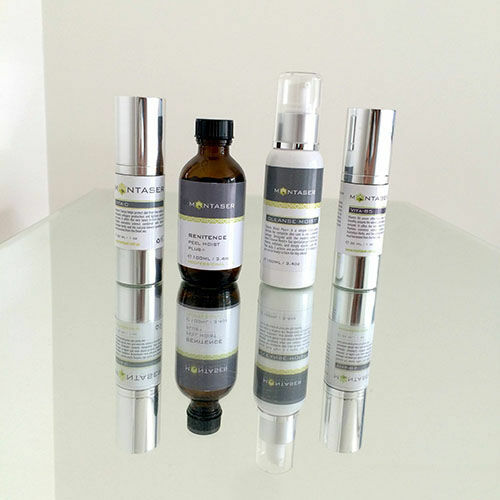 This includes the use of the Montaser Cosmeceuticals skin care range. Montaser is an Australian owned company and their products are made right here, using only chemical free ingredients to create gentle, fast-acting solutions suitable for all skin types. Incorporating the latest scientific discoveries and using the latest advances in stem cell and peptides actives, Montaser uses organic pharmaceutical grade therapeutic ingredients to achieve natural, anti-aging skincare products. In fact, 97% of Montaser ingredients are organically grown, or occur naturally. Montaser believes in following a unique delivery system, whereby products are applied at the right place and at the right time, in order to optimise your skin’s health.